Nisei pioneer’s legacy includes organ transplantation and support for Nikkei community. Dr. Paul Ichiro Terasaki, a pioneer in organ transplant medicine and a major benefactor to UCLA and numerous institutions in the Japanese American community, died at his home on Monday. He was 86. The announcement of Terasaki’s passing came on Tuesday from the Terasaki Research Institute. A memorial service is being planned and will be announced at a later date. Terasaki’s advancements in tissue typing transformed the field of organ transplantation. In 1964, Terasaki developed the microcytotoxicity assay, a tissue-typing test to match organ transplant donors and recipients. The test required only 1 microliter each of antisera and 1 microliter of lymphocytes (human white cells) used to identify human leukocyte antigens (HLA). The test was adopted as the international standard for tissue typing. The UCLA Kidney Transplant Registry, which was established by Terasaki in the 1970s, was the first and largest in the world until the establishment of federal registries. In 2010, his UCLA colleague Dr. J. Michael Cecka, a professor of pathology and laboratory medicine, explained the significance of Terasaki’s advancements in tissue typing. “Not only has tissue typing been key to the success of bone marrow transplants and prolonged graft survival for patients fortunate enough to receive a well-matched kidney transplant, but the cross-match test he developed in the 1960s is still used today for all kidney transplant patients and select candidates for hearts, lungs, pancreata, bowels and sometimes liver transplantation to avoid catastrophic rejections that are mediated by antibodies against the donor’s human leukocyte antigens (HLA),” Cecka stated. An astute businessman, Terasaki launched One Lambda in 1984, with eight former graduate students. Sold to Thermo Fisher Scientific in July 2012 for approximately $925 million, One Lambda has played a central role in the development and advancement of tissue typing. 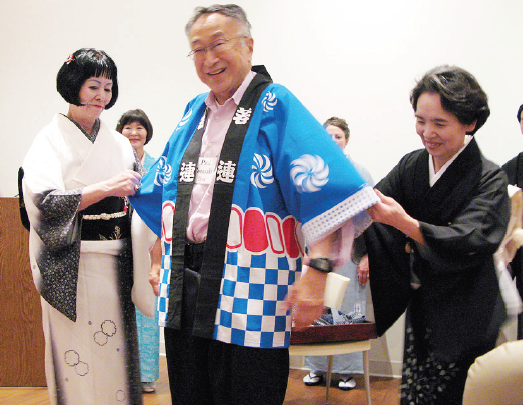 Dr. Paul Terasaki, founder of the Nibei Foundation, is given some help putting on a happi coat by Fumi Akutagawa (left) and Masako Kobayashi, president of the L.A. Kimono Club. Terasaki was born to a poor Issei family in Boyle Heights in September 1929. His father opened a cake shop in Little Tokyo in 1941, but was forced to sell the shop at a loss when Japanese Americans were forcibly evacuated from the West Coast. Terasaki, age 12, spent the duration of the war in the Gila River Relocation Center in Arizona with his parents, two brothers and an aunt. “There were no worries about crime or drugs or any other negative influences that most kids face today, and young children, without proper schooling, were left to play. But for those older, who were drafted into the Army while their families were in camp, life was much more difficult,” he said in a 2010 interview. The family moved to the south side of Chicago after the war. From age 16 on, Terasaki worked constantly. During his senior year in high school, he worked 10 to 12 hours a day as a restaurant busboy on Saturdays and Sundays, earning 40 cents an hour plus tips. When he graduated from high school in Chicago, Terasaki thought of attending radio repair school. However, his mother thought he should go into medicine, and he entered the University of Illinois at Navy Pier as a pre-med student. 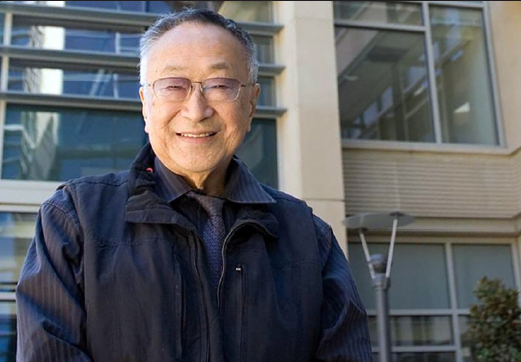 When the family felt it was safe to move back to Los Angeles, Terasaki applied to UCLA and was admitted as a transfer student in 1948, at age 19, beginning a lifelong association with the university. 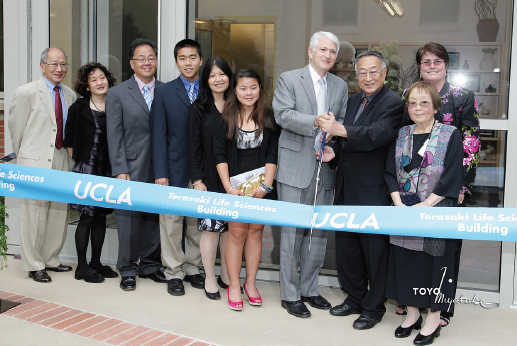 Terasaki, a UCLA professor emeritus of surgery, donated millions to his alma mater, including $50 million in 2010 to the Life Sciences Division, which renamed its building the Terasaki Life Sciences Building in his honor. The donation is one of the largest in the school’s history. In 2006, he gave $5 million to the UCLA International Institute, which was renamed the Paul I. and Hisako Terasaki Center for Japanese Studies. 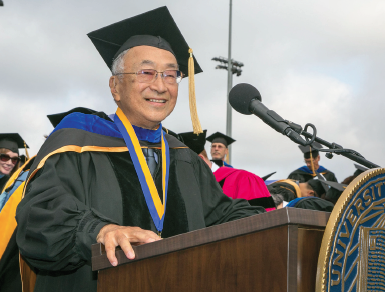 In 2012, Terasaki was awarded the UCLA Medal, the university’s highest honor. Terasaki’s philanthropy extended to the Japanese American community. He was a major donor to organizations including the Japanese American National Museum and the Japanese American Cultural and Community Center. He established the Nibei Foundation, which regularly hosts Japanese cultural outreach events at its Los Angeles headquarters. He received many awards, including the prestigious Medawar Prize. The prize, named after Nobel Laureate Sir Peter Medawar, recognizes the outstanding investigators whose contributions have had a profound influence on the field of organ transplantation. It is universally considered to be commensurate with the most outstanding world prizes for scientific achievement. Terasaki is survived by his wife, Hisako; four children, Mark, Keith, Taiji, and Emiko; and six grandchildren. The family has asked for privacy during this time. Paul Terasaki accepts the UCLA Medal, the university’s highest honor, at the UCLA College of Letters and Science commencement ceremony on June 15, 2012. JANM President and CEO Greg Kimura said in a statement, “When I think of Dr. Paul Terasaki, the term ‘humanist,’ in the Renaissance sense of the word, comes to mind. Dr. Terasaki’s work extended the range of human knowledge in the biological sciences. It also literally extended the lives of thousands of folks who benefited from the discoveries and advancements he made as a research scientist, especially in the area of tissue transplants. “As a teacher and mentor, he has influenced more than a couple of generations of physicians and researchers, including, as I discovered recently, my own doctor. “But his support also extended beyond the natural sciences and other research at his beloved UCLA, where the biology research building bears his name. He was a generous supporter of the Terasaki Center on Japanese Studies there, as well as the arts, economics, culture, and humanities, including the U.S.-Japan Council, the Japanese American Cultural and Community Center, and, of course, here at the Japanese American National Museum. “The garden café and orientation theater at JANM bear his family name. He was a long-time sponsor of our signature event, the annual JANM Gala, which is the largest of its kind in the JA community, and he had been a recipient of JANM’s lifetime achievement award. Folks might not know that he also supported the refurbishment of the Museum Store as a way to keep a sustainable stream of funding coming to JANM. I recall his pleasure visiting during the Hello Kitty exhibit and his delight seeing the lines of people waiting to get in. David K. Yoo, director and professor of the UCLA Asian American Studies Center, said, “Dr. Terasaki was a long-time UCLA faculty member and pioneering medical scientist and an alum who earned three degrees from UCLA. His generosity to UCLA over the years took many forms and included the Asian American Studies Center, to which the Terasaki family supported student scholarship​s​ and a key gift to establish the Yuji Ichioka and Emma Gee Endowment in Social Justice and Immigration Studies.